Well, those are some big words and Comodo Firewall is generating some big buzz online. Can it get the job done? In our tests, this firewall definitely held its ground. Our port scan returned pure stealth, as should be expected. When we tested for leaks, Comodo passed almost every test we threw at it, and performed just as well under our kill testing. Not perfect, mind you, but well enough that it stood out in this crowd. Malicious code will have a tough time getting past this firewall. To its credit, the program's resource utilisation was also reasonable. 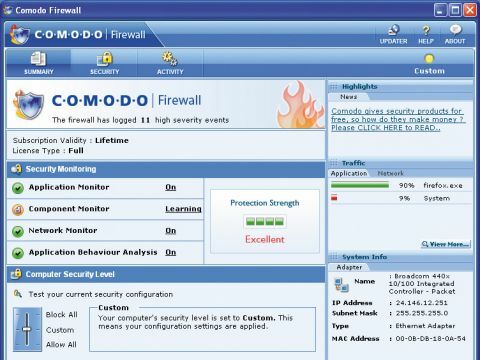 If there's any weakness with Comodo, it's with respect to the program's interface. It's sure to appeal to the more technically inclined, but less-experienced users will have a tough time understanding what all the different features and settings are about. Anyone looking to make configuration changes will need to read carefully and may well need to grab a technical dictionary to translate. This firewall was brought to market by techies, not usability-focused designers. We hope that someone will come up with a simplified, basic mode for the product. If they do, the competition should look out.